About Us – DFW Coin & Jewelry Center | Americas top buyer of rare coins and currency. Call us today at 214.952.7517! In 2014, Kris Oyster, a thirty-five year coin dealer and industry veteran founded DFW Coin & Jewelry Center in Dallas, Texas. Oyster has been active on the nationwide show circuit for most of the last ten years, usually wholesaling items to leading dealers who are familiar to thousands of collectors in all fifty states. Collectors can now buy directly from his new firm, which also actively buys coins, bullion, watches or jewelry from the public. From 1997 to 2013, Oyster was a key employee of Dallas Gold & Silver Exchange, one of the largest coin, bullion and jewelry firms in the nation. During most of that time, he was the managing director of numismatics (coins, medals and paper money). Oyster ran the coin department. His responsibilities included overseeing the buying and selling of scarce or rare coins in more than twenty-five stores. Oyster handles a wide variety of coins, medals and paper money. He has bought and sold U.S. coins dating from the 1700s to the present, in all metals. Early 20th century U.S. gold coins are one of his specialties, as are silver dollars. Though most of Oyster’s time is devoted to coins, he has much experience with paper money, including selling: small size notes, large size notes, Treasury notes, gold certificates, obsoletes from the early 19th century, and hundreds of different National Bank Notes. Oyster has also bought and sold many vintage and luxury watches, plus a variety of jewelry. 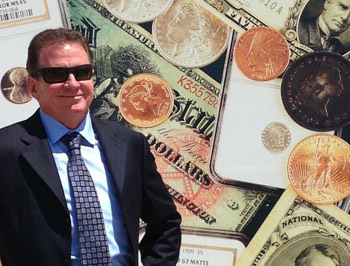 He is certified as a diamond expert by the GIA and is also a member of many major numismatic organizations, including the ANA, FUN, and the Central States Numismatic Society. Even though Oyster has sold tens of millions of dollars of rare coins, including many large deals and five figure items, he patiently works with customers of all income and knowledge levels, saying “Every customer is important.” Beginning collectors are welcome, as are people who seek to sell coins, paper money, watches or jewelry for cash. Collectors are welcome to call (214) 952-7517 to make an appointment.